Antibiotic resistance is a growing threat in bacterial pneumonia. While immune-stimulating treatments can help the body kill the bacteria, they can also cause inflammation that damages and weakens lung tissue. Researchers at Boston Children's Hospital now describe an approach that offers the best of both worlds: enhanced bacterial killing with reduced lung damage. Their findings were published April 4th in Science Translational Medicine. When the immune system sees a bacterial infection, it triggers an influx of cells known as neutrophils at the infection site. Neutrophils can kill the bacteria, but they also cause harm by releasing inflammatory compounds that damage the lung's air sacs. "The question is, when we have pneumonia, do we want to enhance neutrophil function or suppress it? It's very tricky," says Hongbo (Robert) Luo, PhD, a researcher in the Department of Laboratory Medicine at Boston Children's Hospital and senior investigator on the study. Luo's lab has long been studying an enzyme called IP6K, and recently showed that it inhibits signaling by another molecule in neutrophils called PIP3. When IP6K is inhibited in a mouse model, PIP3 becomes elevated and neutrophils become more active, killing more bacteria and living longer – "like 'super' neutrophils," says Luo. 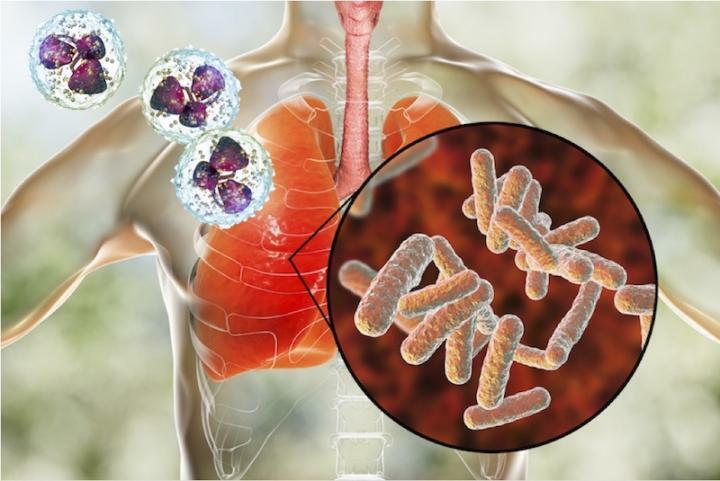 Luo's team, with collaborators at the Chinese Academy of Medical Sciences and Peking Union Medical College in China, decided to further investigate IP6K1's role in neutrophil function in a mouse model of bacterial pneumonia. When the team deleted the IP6K1 gene in the mice, they saw enhanced bacterial killing by neutrophils, which more actively engulfed bacteria and killed them with toxic compounds. But the researchers also saw reduced neutrophil accumulation in the lungs' air spaces and reduced lung damage. "This was a surprise," says Luo. "The exciting thing is that bacterial killing is high, and tissue damage is low." When the researchers used an IP6K inhibitor drug called TNP instead of genetic manipulation, results were the same. Why was there less neutrophil accumulation? The team found that the effect was occurring through blood platelets, which produce a chemical regulator known as polyphosphate that make neutrophils more active and apt to migrate. "When we inhibit IP6K, platelets make less polyphosphate, reducing neutrophil recruitment," explains Luo. "But when the neutrophils get there, they kill bacteria more. We have a treatment that can enhance neutrophils' bacterial killing activity, but their recruitment is controlled, so we have better outcomes." Luo cautions that TNP has never been tested as a potential drug in humans. But he thinks the study findings may have implications not just for bacterial pneumonia, but for other infections that involve neutrophils. In addition, Boston Children's Transfusion Medicine group, where Luo's lab is based, is interested in pursuing IP6K inhibition in cancer patients, who often have severely reduced neutrophil counts that put them at high risk for infection. "We could try transfusing neutrophils, treated with TNP to enhance neutrophil function, but leaving platelets untreated so that neutrophil recruitment wouldn't be inhibited," Luo says. The study was funded by the National Basic Research Program of China (2015CB964903), the Chinese Academy of Medical Sciences Innovation Fund for Medical Sciences (2016-12M-1-003; 2017-I2M-1-015), the Chinese National Natural Science Foundation (31471116), the National Institutes of Health (R01AI103142; R01HL092020; P01 HL095489; R01DK103746) and the Flight Attendant Medical Research Institute (CIA 123008). Qingming Hou of Boston Children's Hospital and Fei Liu of the Chinese Academy of Medical Sciences/Peking Union Medical College were co-first authors on the paper. Coauthors were: Anutosh Chakraborty and Solomon H. Snyder of the Johns Hopkins School of Medicine; Yonghui Jia, Amit Prasad and Li Zhao of Boston Children's; Hongbo Yu of the VA Boston Healthcare System; Keqiang Ye of Emory University School of Medicine; and Yuanfu Xu of the Chinese Academy of Medical Sciences/Peking Union Medical College.